While Switzerland is the country most people associate with Gruyere's origin, its history actually encompasses several European countries. About a thousand years ago, the Holy Roman Empire extended its wily grip around all of what we now know as France, Switzerland, and some of Germany, and the forests of this area were called "gruyeres." 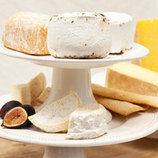 Charlemagne's men sold wood to the cheesemakers of the area to power their curd cooking kettles, and the cheesemakers paid for the wood with their cheeses. 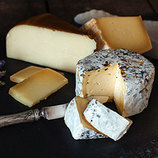 These are the cheeses that we now know, eat and love as Comte and Gruyere. Master cheesemakers since 1782, Emmi is now the agent company for a traditional coop of dairies and cheesemakers. 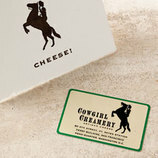 This Gruyere is made just northeast of Lake Geneva in Western Switzerland. 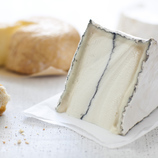 Aged in caves where the air and natural bacteria endow the cheese with a deep complexity, this cheese matures for at least a year. It is smooth in texture and has rich, beefy flavors that are tempered by hints of apples and pears. 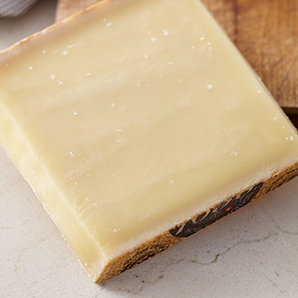 Famously used in fondue recipes, this cheese melts fabulously and is amazing in grilled cheese sandwiches, gratins, sauces or just for snacking.